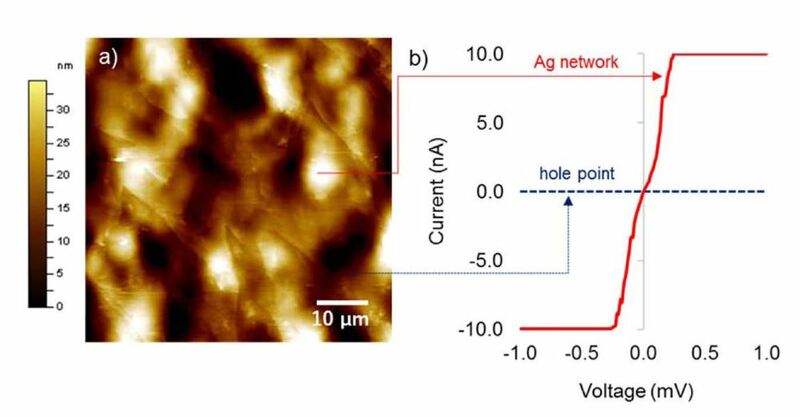 The current-sensing scanning probe microscopy (CSSPM) images for this article were taken using a NANOSENSORS™ Platinum-Silicide AFM probe. ( PtSi-CONT ). a) Topography SPM image, and b) I-V curves of the polymer-Ag honeycomb film on HOPG (preparation conditions for polymer-Ag honeycomb film: poly(NVK-co-MAH)-g-PMMA from PMMA (Mn=2100), 0.3 mg mL−1 and 50μL; measurement conditions: topography SPM image was taken by contact mode using microfabricated PtSi-coated cantilever (f0: 15 kHz, C: 0.2 N m−1), and the I-V curves were taken at specific points. Open Access The article “Conductive Polymer-Ag Honeycomb Thin Film: The Factors Affecting the Complexity of the Microstructure” by Sajjad Husain Mir and Bungo Ochiai is licensed under a Creative Commons Attribution 4.0 International License, which permits use, sharing, adaptation, distribution and reproduction in any medium or format, as long as you give appropriate credit to the original author(s) and the source, provide a link to the Creative Commons license, and indicate if changes were made. The images or other third party material in this article are included in the article’s Creative Commons license, unless indicated otherwise in a credit line to the material. If material is not included in the article’s Creative Commons license and your intended use is not permitted by statutory regulation or exceeds the permitted use, you will need to obtain permission directly from the copyright holder. To view a copy of this license, visit https://creativecommons.org/licenses/by/4.0/. The screencast on the wear-resistant conductive platinum silicide AFM probes -( PtSi) held by Dr. Oliver Krause on Youtube https://youtu.be/w0Tjg08ai-I has just passed the 500 views mark. Congratulations Oliver!